Maitane Berecibar is at the Mobility, Logistics and Automotive Technology Research Centre (MOBI), Vrije Universiteit Brussel, 1050 Brussels, Belgium. A problem that hinders the rapid development of battery technology is that testing and monitoring battery ‘health’ — which affects battery life — takes a long time. Better methods for predicting battery lives are, therefore, much needed, but are extremely challenging to develop. Writing in Nature Energy, Severson et al.1 report that machine learning can be used to construct models that accurately predict battery lives, using data collected from charge–discharge cycles measured in the early stages of a battery’s life. Society needs to stop producing carbon emissions if it is to tackle the impending climate crisis. To achieve this aim, a twofold approach has emerged: the electricity sector is making use of renewable-energy sources; and electric vehicles are replacing those that use conventional combustion engines. Both transitions come with their own barriers. One of the main hurdles for renewable energy is that the sources are often intermittent, producing an imbalance between demand and supply. The issues with electrified transport are ensuring that enough electricity is produced to charge all vehicles when conventional combustion engines are no longer used, and the integration of charging infrastructure with the electrical grid. The on-board energy-storage units of electric vehicles could, in principle, act as an energy buffer for the electrical grid if bidirectional chargers are deployed — cars spend most of their time parked, so by returning their electricity to the grid when stationary, they could help to compensate for fluctuations in the supply associated with renewable energy. The commercialization of electric and hybrid vehicles has, therefore, stimulated a growing demand for long-lived batteries, both for driving and for grid buffering. As a result, methods for assessing battery health are becoming increasingly important. A figure of merit known as state of health (SOH) is used to quantify the ability of a battery to store energy, relative to its initial or ideal conditions. SOH is reported as a percentage: it is 100% when the battery is new, but decreases over time. Estimating the SOH of a battery is essential to ensure safe and correct usage. However, there is no consensus in industry or among scientists about what exactly SOH is, or on how it should be determined. The SOH of a battery reflects two phenomena that occur as batteries age: progressive loss of storage capacity, which is known as capacity fade; and progressive increase of impedance (a measure of electrical resistance), which causes the power provided by the battery to decline. Estimates of a battery’s SOH, therefore, have to take into consideration both capacity fade and impedance increase. Unfortunately, lithium-ion batteries are complex systems, which means that capacity fade and impedance increase arise from several interacting processes. Most of these processes cannot be studied independently and occur at similar timescales, which complicates the investigation of ageing mechanisms. SOH, therefore, cannot be determined from a single direct measurement. Conventional methods for estimating SOH involve studying interactions between a battery’s electrodes (see ref. 2, for example). Unfortunately, most of these methods make the battery unusable, which is clearly undesirable. SOH can be determined in a less destructive way by using two different approaches3: adaptive models and experimental techniques. Adaptive models learn from battery-performance data and thereby self-adjust to reduce errors. They are useful when system-specific information about a battery is not available, and are good for diagnosing the degradation processes that affect battery health. The main problem with such models is that they need to be trained using experimental data before they can be used to determine the present capacity of a battery. Experimental techniques can be used to evaluate specific physical processes and failure mechanisms that occur in a battery, enabling the future rate of capacity degradation to be estimated (see ref. 4, for example). A limitation of these approaches is that they cannot detect intermittent failures. Alternative techniques that consider the rate of change of voltage or capacity (rather than raw voltage and current data) have also emerged in the past few years as useful tools for revealing battery-degradation mechanisms5. Nevertheless, finding other methods that accurately predict the lifetime of batteries is essential to accelerate the development of battery technology. Severson et al. have tackled this challenge by generating a comprehensive data set that characterizes the performance of 124 commercial lithium-ion batteries (more specifically, batteries that use lithium iron phosphate as the cathode material and graphite as the anode) as they undergo cycles of charging and discharging. The authors used a variety of fast-charging conditions (but identical discharging conditions) to alter the cycle lives of the batteries — the number of cycles that a battery goes through before it reaches the end of its life. 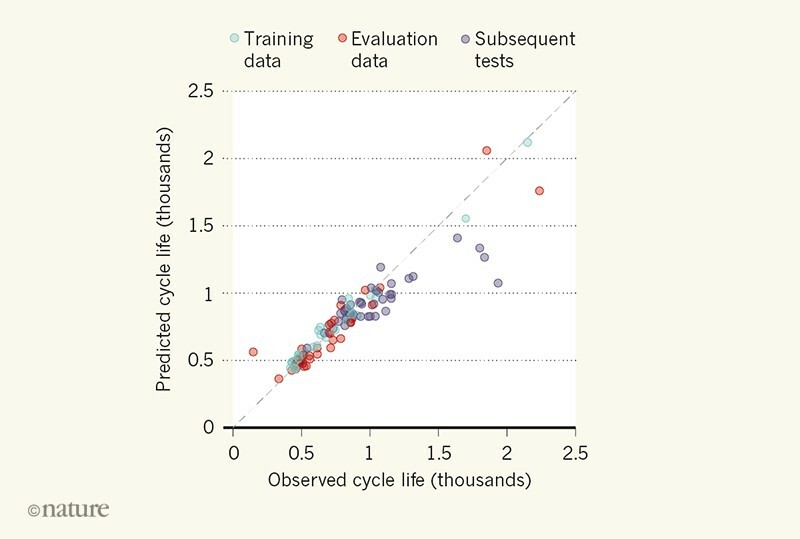 A wide range of cycle lives (from 150 to 2,300) was therefore captured in the data. The researchers then used machine learning to analyse the data, and thereby produced models that can reliably predict battery cycle lives. Notably, the authors analysed data from only the first 100 cycles of each experimentally characterized battery — which was before the batteries showed clear signs of capacity fade. The best model correctly predicted cycle lives for about 90.9% of the batteries in the study (Fig. 1). Severson et al. also used their approach to analyse data from just the first five cycles of experimental data to classify batteries as either having a short or a long lifetime (that is, cycle lives of fewer than or more than 550 cycles, respectively). In this case, about 95% of the model’s predictions were correct. Figure 1 | Predicted and observed lifetimes of batteries. Severson et al.1 collected data that characterized the charge–discharge cycles of 124 commercial lithium batteries. They also recorded the cycle life of each battery — the number of cycles until the battery had only 80% of its original energy-storage capacity. The authors analysed the data using machine-learning tools, and thereby devised models that predicted the cycle life of a battery on the basis of data collected from the first 100 cycles of that battery. The best model (data shown) correctly predicted cycle lives for 90.9% of the batteries in the study. Blue dots represent data used to develop the model; red dots show data used to evaluate model performance; purple dots show data from batteries tested after model development; and the dashed line indicates where predictions and observations are equal, for reference. It is notable that this level of accuracy was achieved by analysing data recorded during discharge experiments, rather than by only considering capacity-fade data. Moreover, the models did not involve slow test cycles, or require any assumptions to be made about the chemistry and degradation mechanisms occurring in the batteries, which had been the case in previously reported studies that used machine learning6. However, it should be noted that the new models were less effective at estimating cycle lifetimes for batteries that had undergone greater degradation. Severson and colleagues’ work shows that data-driven modelling using machine learning is a promising route for prognostics of lithium-ion batteries, and could, therefore, aid the development, manufacture and optimization of emerging battery technology. The authors propose that their models identify degradation modes that are not manifested in capacity-fade data during early cycles, but are instead evident in plots of voltage data. Accordingly, their approach for predicting cycle life complements all previously used approaches. More broadly, the study reveals the potential of combining deliberately generated data with data-driven modelling to predict the behaviour of complex dynamical systems. Severson, K. A. et al. Nature Energy https://doi.org/10.1038/s41560-019-0356-8 (2019). Yi, L. et al. J. Power Sources 373, 40–53 (2018). Berecibar, M. et al. Renew. Sust. Energ. Rev. 56, 572–587 (2016). Dubarry, M. et al. J. Power Sources 360, 59–69 (2017). Dubarry, M., Truchot, C. & Liaw, B. Y. J. Power Sources 219, 204–216 (2012). Berecibar, M. et al. J. Power Sources 320, 239–250 (2016).